If you have never been faced with a very serious health condition, you might not think very much about health insurance. In the United States, if you are fortunate, you have coverage through your job or you bought a policy on one of the new government web sites. Hopefully, the benefits are reasonable. You pay your copays, perhaps $25 or so when you see the doctor for a physical. Perhaps, you have a few prescriptions here or there, but nothing too major. This was the way we were, extremely fortunate, somewhat naive and not overly concerned. We had physicals once a year. We did not really think all too deeply about the exact details of our health insurance policy. Ignorance is bliss. We believe our health benefits are good, even above average. We continue to learn about our policy and the specifics of how we define good coverage. Now with the Affordable Care Act, the general population has probably learned a bit more about health insurance, shopping on the exchanges, and reading about the various policies and options. Even in good health, I’m sure there are some people who pay careful attention to their insurance policies. Kudos to those individuals! It’s incredibly important. GM1 is an extremely strong forcing function that emphasizes the importance of health insurance. The most harrowing experience with our insurance so far was trying to get the coverage for miglustat for Iris. Miglustat is not FDA-approved for GM1. Our doctors told us that miglustat is possibly our one and only chance to slow down the progression of the disease. It’s absolutely terrifying when obtaining a medication for your child is in the hands of an insurance company. When we first started out on this journey, I was extremely poorly outfitted for battle. I was armed with my flimsy insurance card and a 1-800 phone number. The first group of doctors we saw after diagnosis recommended miglustat at the first appointment where we met them. I had already read about it a bit. Naively, I thought they would write a prescription and we would go home with the drug in hand. This is absolutely not how things unfolded. This is not Tylenol or an antibiotic. This is a drug that costs more money than nearly anyone in the entire general population can afford. No one can afford miglustat without insurance, except the fabulously wealthy. To be specific, for the particular dosage recommended by our doctors, the cost is more than $1000 a day. Perhaps your insurance gets a better rate than ours or perhaps you live in another country where the drug is cheaper. Still, who can or would want to shell out the cost of this drug without insurance? At the first appointment where the drug was mentioned, we were told that the next step was the confirmation of the diagnosis through DNA testing. We were told that the DNA testing would take 16 weeks. Before the DNA testing, we had 2 enzyme panels to confirm the diagnosis. This particular team of doctors seemed to want to wait to prescribe the medication until those DNA tests were conducted. In retrospect, perhaps they also wanted to give us the space the think about the prescription. At that same appointment, the geneticist mentioned the names of three specialists whom he considered the best in the country with respect to GM1. Hours after the appointment, I sat at my laptop, wracking my brain, trying to recall the names of the three specialists that were mentioned. I emailed the other doctor who was present at the appointment to ask him for the names of the specialists. He was the only doctor who gave me his email address. Frankly, I know he later regretted giving me his email. I barraged the poor doctor with questions. Learning was my way of coping. Unfortunately, he did not remember the names of the specialists either. I started searching the internet for various doctors who specialize in lysosomal storage diseases, carefully perusing the names of the doctors. Eventually, after hours of searching, I recalled all three names, using Google to prompt my memory. I regretted not writing down the names at the appointment. I like to believe that I am a relatively organized person. The high level of emotional distress at these first appointments made it incredibly hard to process or remember anything. 16 weeks of waiting for a DNA panel before initiating treatment was simply too much for me to bear. I contacted the specialist who was closest geographically. We made an appointment to see the specialist in the Midwest, more than 1500 miles away and they promised to help us initiate treatment. The first available appointment was approximately 8 weeks following the diagnosis. It was the doctors in the Midwest who first initiated the request to get insurance coverage for miglustat. In retrospect, I’m so grateful that we kicked off that process of getting insurance coverage before the DNA testing was complete. The DNA testing took forever. The insurance approval process to get miglustat took forever too. The processes we endured were slower than any hospital dramatization on television would ever have you believe. Our local neurologist tried to stay positive, telling us “insurance companies usually come around.” What if we were in the group for whom the company does not “come around”? Iris is already in that incredibly tiny minority of those diagnosed with GM1. How could we have confidence that fate would not have its way with us again? By the time the second denial rolled around, complete panic had set in. I started to harbor a high level of animosity towards our insurance company. Isn’t the purpose of health insurance to pay for extremely expensive drugs and procedures? I frantically formulated a plan on how to get the drug approved. Our first neurologist mentioned compassionate use, i.e., asking the drug company to just give the drug to us. This involved consulting another family in England who had obtained the drug directly from the pharmaceutical company and consulting their physician. I was told that the CEO of the company is a good man, but otherwise, I was not sure how to proceed. I contacted the company directly via an online form and spoke to someone on the phone who told me to ask our doctors about working with their specific compassionate use program. I consulted one of the doctors in the Midwest about compassionate use. The doctors in the Midwest had a ton of experience with getting the approvals. Still, by the time I mentioned compassionate use and the second denial had occurred, those very same doctors told us that prayers were in order. The prospects of getting the drug were waning. Visions of selling every belonging we own to get the drug kept me up at night. I contacted a patient advocacy organization and enlisted their help. I started nagging all of our local doctors for letters of support to supply to the insurance company. I sent a cute picture of Iris to be included in the appeal. I wanted the insurance company to see the face of a little girl who needed this medicine as opposed to just seeing the black and white type of her medical records. Through the patient advocate, supporting materials and letters were submitted from the National Institute of Health. For the third and final appeal, an external review, in summary, we submitted 3 letters of support from our local doctors, a letter of support from the patient advocacy group, and we submitted the materials from the NIH. The doctors from the Midwest included more than one hundred pages of materials that included medical records and relevant research. All the documents were sent via certified mail. The team in charge of the appeals said that in the past, appeals had been lost or the insurance companies claimed to have never received them. Ultimately, our primary insurance approved coverage. We prevailed. The third appeal was successful. The external review panel approved the coverage in December 2013, 4 months after diagnosis. Our primary insurance company conveniently neglected to tell us that they approved the coverage. It was not until I called them for the n-th time in January that someone actually told me the coverage had been approved in early December. I had to request a letter to document the official approval. That letter did not arrive until the end of January. I never realized the extent to which the parents are responsible for advocating for their children. Of course, I have some inkling. I am a responsible person and parent. Still, somehow the extent of my role in navigating the healthcare system surprised me. I was somewhat shocked when one of our main doctors told me that I am the one in the driver’s seat. I never imagined the herculean effort that is required to manage this process. The sheer number of emails and phone calls exhausted me. We are so grateful that all the blood, sweat and tears yielded an approval. Do not take your health insurance for granted. Do not take your health for granted. If your insurance company denies coverage, ask again and ask again. Ask as many ways as you know how. Do not stop until you get what you need for your child. I want to share something with you that your doctors might not tell you. Miglustat tastes like vomit. Really. For many children, even ones who do not have dysarthria or difficulty controlling their tongues, it’s impossible to swallow a pill. Iris is not able to swallow pills and for now, the only way to deliver the medication is by mouth. We originally tried to teach Iris to swallow pills. We went out and bought sugar-free tic tacs and we bought several special cups that are supposed to help people swallow pills. The tic tacs just rolled off her tongue and out of her mouth. Standard parental advice would be to mix the medication into apple sauce or peanut butter or a food item so you can use to mask the flavor. Standard parental advice does not apply to a truly strict ketogenic regimen. Applesauce, nope. Peanut butter, nope. Bacon, definitely. Actually, Iris does not like bacon…The taste is bad enough that you need a lot of the food item to mask its horrible flavor. The sugar-free lemonade is the base canvas to mask the taste. Try the ones with stevia first. Our doctors told us to avoid aspartame if we could, but honestly, the aspartame ones taste better. 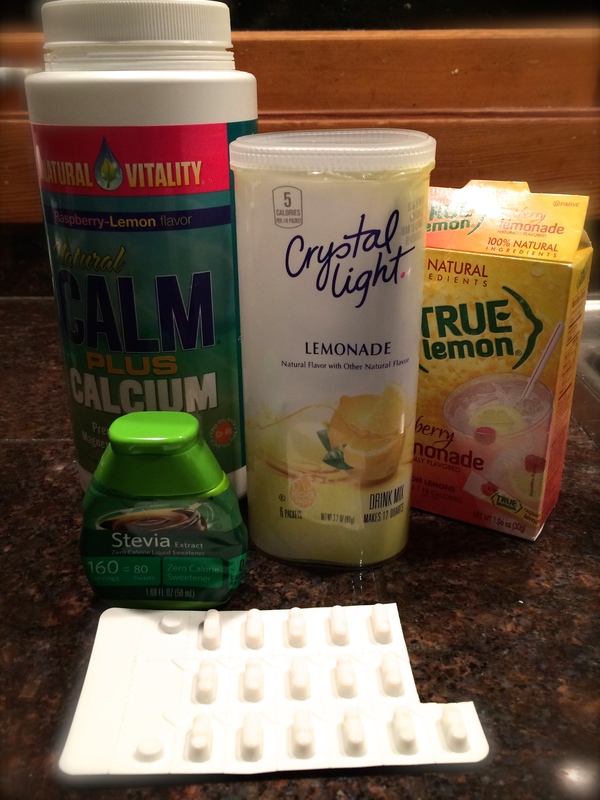 Given the choice between not being able to administer the medication at all or using aspartame, we had to switch back after trying stevia lemonade. The Cal-Mag is a calcium magnesium supplement. We use it to help with calcium supplementation due to the ketogenic diet for two reasons. Iris can not have milk and other sources of calcium as much as one might normally. Iris does love zero carb cheese though! Also, the magnesium helps with digestion/regularity. Lastly, the CALM has a raspberry stevia flavoring. The liquid stevia is used to put the sweet taste over the top. All kids are different! I can not promise this will work for you, but it is how we manage. A colorful and fun straw also helps. Oh, and a cute cup. Good luck! Iris is currently participating in a clinical trial. The clinical trial is a regimen of a medication called miglustat (Zavesca) in combination with the ketogenic diet. All the other clinical trials are either observational only or involve bone marrow transplant. The one team we spoke to with respect to a bone marrow transplant required asymptomatic patients. Unfortunately, Iris is not in that category of patients. For our family, we are also not sure we would have chosen that path. 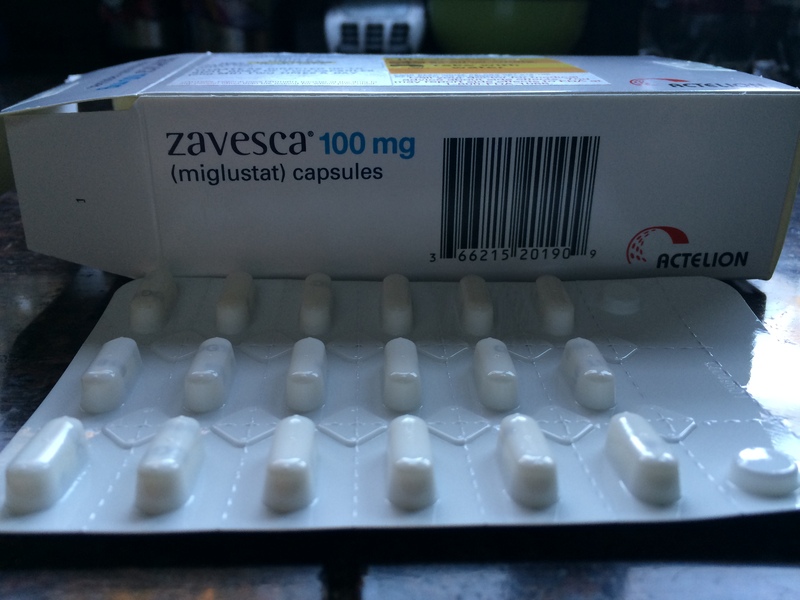 Miglustat is FDA-approved for Gaucher disease, another lysosomal storage disease that affects the brain. The basis of the trial is threefold. Miglustat is believed to possibly be more effective in combination with the ketogenic diet, perhaps as much as 300% more effective. This belief is based off a single research study in rats. The ketogenic diet is also used to control seizures. Many GM1 patients suffer from seizures. As of now, Iris is very fortunate to not have seizures. The diet is also used to mitigate the gastrointestinal side effects of miglustat. To be clear, some clinical trials are successful and some are not. There is a reason it is called a trial. Furthermore, this specific protocol is not universally accepted. We are very happy to participate in the trial. There’s really nothing else to try. We are hopeful that the regimen is helping Iris. However, it’s not a cure. Hopefully, it’s a way to buy time until a true cure or another treatment emerges. In our own experiences with the regimen, Iris did cease toe-walking after initiating treatment. However, we had also increased physical therapy at the same time. We thought that her walk possibly improved. Then, other symptoms emerged. Her gait changed in different ways and not for the better. We also thought that her speech might have improved for a bit, but that also can come and go. There are 2 aspects of the trial that have clear evidence. Limiting carbohydrates does relieve the gastrointestinal side effects. The ketogenic diet is proven to help some people with seizures. It’s been used for quite some time for that purpose separately from this particular study. In general, there are so few patients to verify results. It can also be difficult for the patients to participate in studies in distant locations. Some other GM1 families told us the regimen helped their children, but the evidence is primarily anecdotal at this point. Technically, Iris is in ketosis, so the diet she follows is ketogenic. However, we achieve ketosis through the Modified Atkins diet. This is a different approach from the more complicated true ketogenic diet involving ratios of fat and protein and calorie counts. So far, we have been fortunate because Iris seems to be able to tolerate Modified Atkins. She is allowed 15g of carbohydrates a day. To put that in perspective, 1 teaspoon of sugar has 4.2g of total carbohydrate. All the carbs Iris consumes are from fruit and vegetables only. Yes, vegetables have carbs. Low carbohydrate is not the same as gluten-free. This means there is basically never dessert at our house. There is no bread basket. There are no ice cream sundaes, no Halloween candy, and no chocolate bunnies. There is not even true birthday cake. There are ketogenic cream puffs. If we make any sweet at all, it is prepared using a sweetener such as Stevia. The ketogenic diet can cause weight loss and that’s the last thing GM1 kids need. To avoid weight loss, the diet incorporates lots of fat to balance the absence of sugars or carbohydrates. Iris’ brother Carter has known the word “carbohydrate” since he was 3. Iris has followed this regimen for nearly a year by mouth. Some other children have feeding tubes and use a keto liquid formula or a blenderized diet. We travel with our own food and snacks always. It is very difficult to establish indisputable evidence that the treatment is effective. Once a course of treatment is established, one can not know the road not taken. One world specialist in GM1 went as far to say that if it were possible to extract the brains of the patients and analyze the brain in a petri dish, it would still be hard to measure the success of the treatment. Another doctor told us that short of a complete miracle and reversal of all symptoms, there can be many gray areas. I don’t know of anyone who experienced a complete miracle, i.e., a cure for GM1, but we sure would love one! A neurologist, a tall man with sandy brown hair and sympathetic eyes, whom I had just met for the first time, patted my arm reassuringly. Unable to control my grief, I sat with tears streaming down my face, choking out the details of our diagnostic odyssey. While listening to Iris’ medical history, the neurologist sat with his head against the wall, seated on the examination table, listening attentively and silently. The details of the prior misdiagnoses seemed to weigh heavily on the doctor. He sunk further into the wall. He took long blinks. We were told, the misdiagnoses we had received were all too common. A year before, we had been told by another neurologist that nothing was wrong and testing was not merited. We had been told by a developmental pediatrician that Iris had mild athetoid cerebral palsy. A geneticist was also present throughout the appointment. Ironically, I can hardly remember our interactions with him. His colorful tie and the distinct level of respect from his colleagues come to mind. He promised to connect us with the best GM1 specialists in the country. A genetics counselor was also present who listened attentively. When the doctors left for their next appointment, naturally, the counselor stayed and counseled me in a soft gentle voice. I have nearly no recollection of what we discussed. I think I mumbled to her that would likely have to get a new house because our current house is not handicap accessible. Finally, a social worker entered the small examination room and introduced herself to me. My mind was racing. My hands clenched a crumpled piece of paper with my questions for the doctors on it. Somehow those questions on the paper seemed so inconsequential. I felt small for telling the doctors I wanted to do whatever they would do for their own children. It felt as though they had heard the same comment from every other concerned parent of a child with a horrible diagnosis. Every parent wants the best possible care for their children. Our previous neurologist, a kind, gentle woman with a small private practice had referred us to this large clinic at an esteemed university. The new neurologist and geneticist at this large clinic were to be responsible for the confirmation of Iris’ diagnosis. For a “big time” disease such as GM1 Gangliosidosis, we were told our health insurance demanded a confirmation from another doctor. We had been given the devastating diagnosis just the day before in the female neurologist’s office. My husband called me from that appointment while I was at work. He told me that he might not even be able to drive the car home because he was having difficultly breathing. For me, the news had not sunk in. I ran through the mental gymnastics of how I would get to the doctor’s office and not have to leave a car behind. I did not even attend that particular appointment. We thought it would be just another appointment, the same as all the others. At the appointment before the diagnosis, we had been told not to be overly concerned. We were told that the chances of a very serious diagnosis were extremely low. Despite our utter disbelief and total dismay, our sweet girl just happened to be that incredibly rare, rare case.